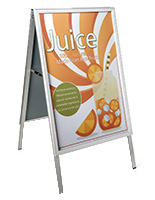 22" x 28" 23.5" x 35.5"
30" x 40" A-frame is double-sided for maximum visibility. Yard sign holders are made of steel for durability. Black finish is a neutral backdrop for any sign. 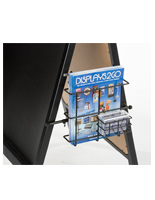 Top, hinged section of frame allows inserts to quickly slide into the channel. Sidewalk display folds up for storage. 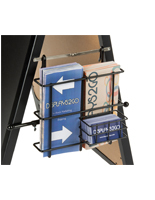 These yard sign holders are for showcasing (2) 30" x 40" advertisements. 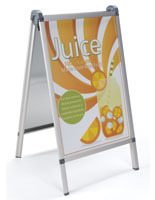 Each double-sided a-frame is ideal for attracting customers from any direction. 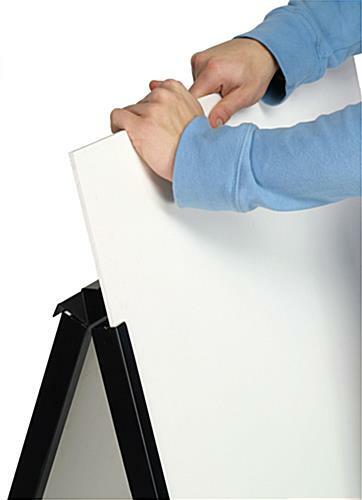 These yard sign holders fold for easy storage. Each real estate lawn display is only 2-3/4" thick when closed. These a-frames are yard sign holders that are easy to use. 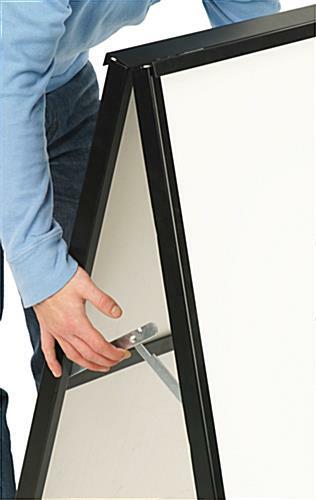 Open the display and lock into place by pushing down the (2) latches, lift them to close. Signage easily slides in and out of the unit by lifting the hinges on the top and sliding the boards into the channels for a secure fit. 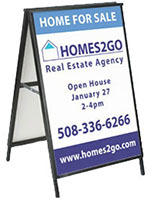 Yard sign holders, called a-frames, are made for thick poster board material such as Coroplast™ and Sintra®. Each advertisement can be up to 3/8" thick. These yard sign holders are durably made, but they do not include any type of lens for protecting the messages. 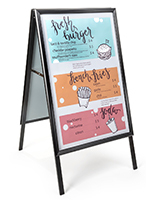 Since this a-frame is typically used outdoors, the advertisements should be UV printed with silkscreen, laminated, or vinyl graphics. These real estate signage frames are yard sign holders that are for two signs and can advertise for open houses or grand openings. 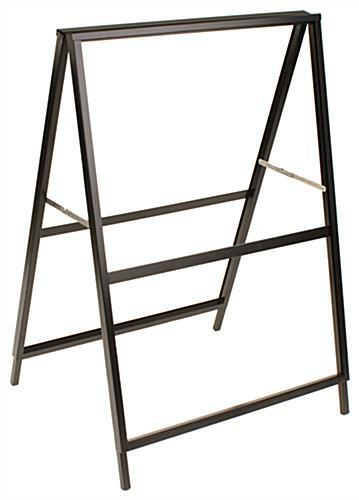 Each black metal a-frame is often used by retail stores, real estate offices, travel agencies, and more. These real estate sidewalk displays are yard sign holders that are constructed of steel for affordability and long-term use. 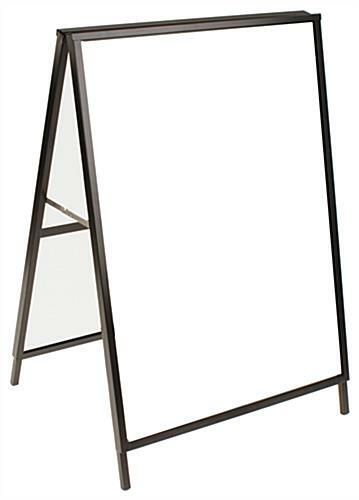 This double-sided a-frame does ship fully-assembled and ready to use with a signboard [not included]. Yard sign holders are a great marketing tool for any type of business. Display an advertisement on a sidewalk to potentially gain new clients today. 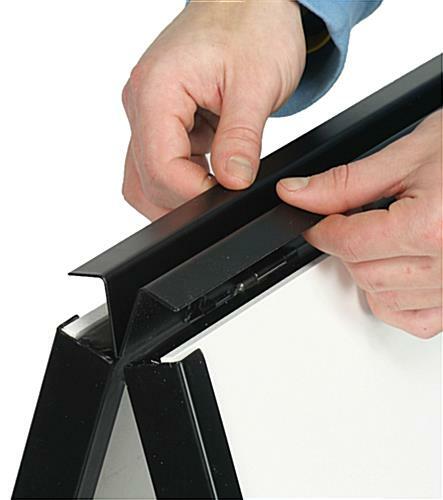 Each a-frame will ship fast from this site when in stock. 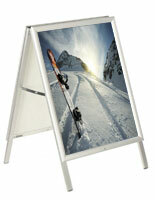 30.4" x 43.0" x 25.3"
Excellent Quality, very sturdy, perfect size. In addition, delivery of product was "very fast". Very happy with my purchase. Thank you for the review. If you are planning on ordering from us again, feel free to like us on Facebook; we offer various social media-exclusive discounts and deals that you may be interested in for future orders!